Begin ALL assessments with scene safety, mechanism of injury/nature of illness, airway, breathing, & circulation. Also, inquire about when the accident took place, what treatments they have already begun, and what led up to it. Make sure you know of all injuries & the number of patients because there could be multiple. Consider that injuries could always be non-accidental. Closed soft-tissue injury - Look for swelling, deformities, contusions, etc. Use the PQRST scale to determine what type of injury you're dealing with. Open soft-tissue injury - Take note of how severe the bleeding is and the size of the wound. Determine what type of damage has been done and the condition of the skin surrounding the wound. Look for objects that may have lodged into tissue or muscle. Burns - Take note of what caused the burn. Determine the severity & how deep it is. Determine how much of the body the burn covers(rule of nines). For burns, it's extremely important to know what type you are dealing with. They consist of superficial burns, partial-thickness burns, and full-thickness burns. Superficial - these burns only effect the epidermis(the outermost layer of skin). They're red but don't usually blister. The most common type are sunburns and other burns will resemble them. Partial-thickness - Blisters are the first sign that a burn has gone past the epidermis which has been destroyed. This means that there is no protection against infection & the dermis has been damaged. Any skin covering the burn will be gray. If it's open it will appear red or white & wet. Full-thickness - The burn has destroyed the epidermis & the dermis, all functions in those areas are gone. It may have gone as far as muscle and bone, but possibly just the subcutaneous layer. These will appear charred or brown & dry. 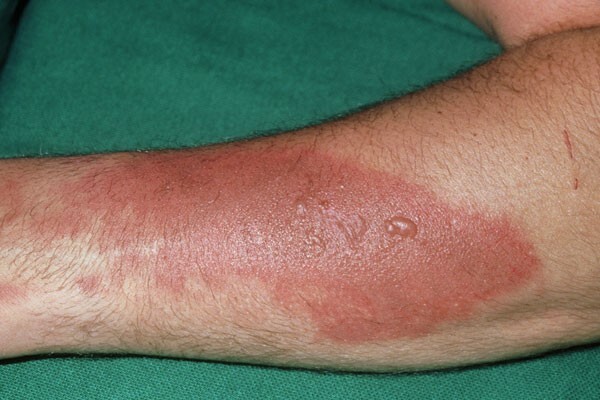 Severity of a burn will determine how prone to infection it will be and the likelihood of survival. Hypovolemia, hypothermia, scarring, bone & joint problems, and respiratory distress are high risks depending on the degree of the burn. Begin ALL treatments by following standard precautions with personal protective equipment and ensuring a clear airway while providing high-flow oxygen. Ensure that hypothermia isn't a threat, keep your patient warm. Sterile dressings and bandages are very important to prevent the spread of infections & diseases. Closed injuries - Place in position of comfort, splint, elevate, ice. Seek medical attention. Open injuries - Apply direct pressure with sterile gauze. Continue until bleeding has stopped or slowed. Wrap with sterile bandage. Elevate. Seek medical attention, especially if the injury was caused by an animal bite. These can cause severe infections. Impaled object - Follow basic treatment except stabilize the object with bandages to prevent further damage. Open injury to abdomen - DO NOT push any protruding organs or apply direct pressure. Apply loose dressings after removing clothing. Burns - Ensure that agent that is causing the burn has been removed. Remove jewelry and constrictive clothing unless the clothing has fused to the skin. 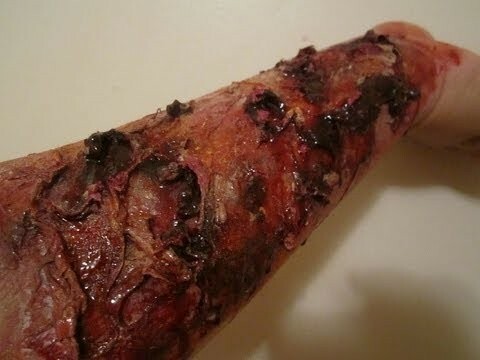 Place sterile dressings over wound and seek medical attention. There are five main things that are known to cause burns. Chemical - When household or industrial chemicals come in contact with skin. Remove chemicals & all contaminated objects. Rinse effected area & bandage. Electrical - When skin comes in contact with electricity from a grounded source or lightning. Make sure that the patient is no longer in contact with an outlet or source. CPR if needed, otherwise bandage wounds. Thermal - When a hot object comes in contact with skin. Remove heat source. Apply sterile bandages. Inhalation - When smoke or chemical inhalation cause airway problems. ALS could be necessary. High flow O2 via BVM is the best treatment available outside of the hospital setting. Radiation - When skin comes in contact with radiation. These are rare. Be extra cautious during treatment. Sterile bandaging & immediate transport are crucial.